Prompted by improved consumer spend, infrastructure development and increased investment by OEMs to support the manufacturing sector, the coolants and lubricants industry in India is witnessing rapid growth potential. With the regulator pushing to implement stringent controls on emissions in order to improve air quality, product development in the coolants and lubricants industry is steered towards green products like those using vegetable-based coolants. As part of its renewed focus on building greater collaboration with customers, Shell Lubricants undertook a study to understand lubrication practices in the manufacturing and construction sectors in India. Findings reveal that India’s manufacturers are engaged and optimistic about Industry 4.0 technologies, with 46% of those surveyed anticipating that the resulting savings could exceed INR 33 million. India’s construction companies on the other hand recognize the benefits of a proactive maintenance approach but are not necessarily succeeding in its implementation. 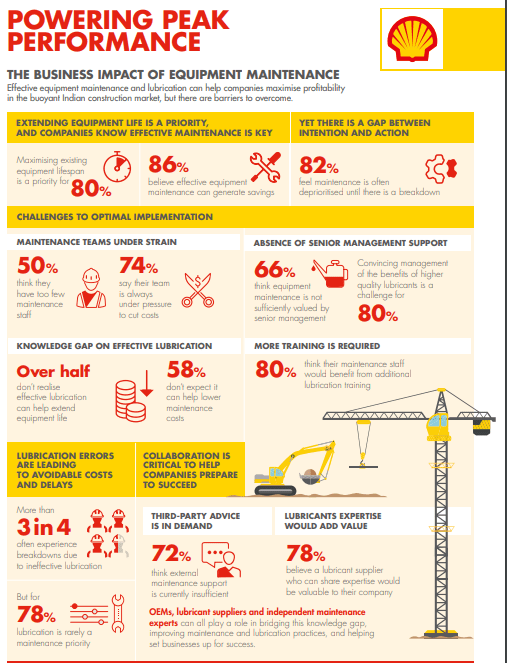 86% of those surveyed believe that effective equipment maintenance can lead to cost savings, but 82% still feel that maintenance is often deprioritized until there is a breakdown. An absence of senior management engagement in the importance of maintenance has come to light as one barrier to effective preventative action. Like developed countries, India, the third largest lubricant market in the world, has also started to implement tighter controls on emissions. “We as a lubricant manufacturer are taking this opportunity to develop eco-friendly solutions in the field of metalworking by reducing dependence on certain elements and heavy metals in our formulations. We are also using certain base oils with better biodegradability as a core component in our formulations. Emissions can be controlled by using bio-based products and effective lubrication. The right choice of product will reduce the traction coefficient and result in saving energy. This is where Arabian Petroleum Ltd (APL) will contribute. We are going to launch a new program called Complete Lubrication Management Program (CLMP) to guide our customers on how to nurture lubricant as an asset right from the time it is brought on-site to the time they are disposed,” says Manan Mehta – Director, Arabian Petroleum Ltd. Oil emission pollution is increasing on day to day basis. Stringent regulatory norms were inevitable. “We are working on green chemistry so that emissions first should pollute at a bare minimum and should be biodegradable. We are working on vegetable oil based lubricants, which will lead to bare minimum pollution,” adds Munish Garg, Managing Director, See Lube Technologies Pvt. Limited. Customers with huge consumption of lubricants like metal working fluids have started working towards vegetable based Lubes for easy disposal. Vegetable-based coolants give extra-ordinary cutting performances and made many difficult machining possible, but simultaneously very expensive and have comparatively less life. However, popularity of products made with a blend of vegetable additives (esters) is gaining fast where prices are moderate with enhanced performance benefit. Ratnesh Kumar Lal, VP Marketing, Raj Petro Specialities Pvt. Ltd. says “our customers are more concerned about coolant and oil disposals. Hence our product development team focused on making long lasting products like high end semi synthetic coolants with life (sump life) of more than one year compare to conventional product of only 2 to 3 months. We also developed environmental friendly products free from boron, chlorine and other halogens.” However, formulating with vegetable oils is coupled with challenges such as high carbon release. So it has to be well-balanced in products to ensure that there are optimum lubrication and zero compromises on the products’ life. The issue of sustainability, also in the lubricant industry is becoming increasingly important and the demand for bio-lubricants is increasing. Biodegradable lubricants are made primarily from renewable raw materials. “As we have always produced our additives based on renewable resources and therefore have many years of experience with these raw materials and related production technologies, the future lubricant industry constitutes a main focal point for us,” explains Yashwant Mahajan, DGM-R&D Lubes, Grauer & Weil (India) Ltd.
Good filtration ensures that products can be reused up to a certain level. But it has to be monitored taking the critical parameters of oil into consideration. For example, while using any coolant, if the flashpoint drops considerably or the viscosity goes up, then it cannot be changed by filtration. “Our lubrication management program helps customers to identify the potential safety issues and resolve them immediately. We also provide customers with free regular testing of products which keeps a check on the necessary parameters and ensures better efficiency,” avers Mehta. Products like hydraulic oils, gear oils, straight metal working fluids are some of the products, which can be reused over a period of time. “At See Lube we are giving the service to our key customers for reusing of lubricants and are conducting training programs in house for identification of Lubricant condition. At some places our teams are taking the samples and testing the lubes for requirement of regeneration through different methods. In short, we are aligned with our key customers for condition monitoring and regeneration of lube at a perfect time so that the useful parameters are not affected and can be reused after regeneration of lubricants, thus reducing the operating costs of our customers,” says Garg. Partnering with customers/ OEMs to develop better solutions for their specific needs is also something that is always done. Mahajan says, “with the product line GROWEL Sustainable Ester Lubes, we have developed the products which are specifically tailored to the lubricant industry. It includes glycols, olefins & esters which are used as base oils for a variety of lubricants. GROWEL offers a complete range of lubricants for metalworking. Chlorine-free, these new generation oils meet the environment friendly standards in terms of toxicity, reprocessing and the environment. GROWEL’s products range have special listings or certifications, they can be used for lubricants with special requirements. In addition to our range of base oils our product portfolio contains high quality metallic soaps, alkaline soaps and fatty acids that are used as additives for different lubricant applications.” S K Singh, Director, S-CCI Golden Cruiser adds, “we had introduced the Super long life coolant range which are being used by many OEMS in India and globally. The change (lifecycle) of these Super long life coolant varies from 8-10 years. That in itself has made a change in the environment. The used coolants which are harmful to the environment primarily for the use of monoetilyne glycol are now being disposed of after a much longer period than earlier. This is a major step towards environment preservation specially in India where there is no organized system of collection of used coolants and treating it or refining it to make it environmentally safe.” Tailor-made solutions are the need of the industry, and that’s where APL has made a mark. For instance, an OEM faced an issue of very low productivity and tool life in a certain broaching operation. We developed a bio-based synthetic lubricant for them, which increased their output from 9000 jobs to 47000 and also increased the tool life. The product has also resolved the issue of excessive misting on the shop floor, which caused safety and regulatory issues. We also developed an EP grease without sulphur chlorine and fluorine for an OEM, and a low viscosity high flash coolant for a grinding application for a tool manufacturer, who until recently used a high viscosity product that affected heat dissipation and lowered the surface finishing,” says Mehta. The global coolants and lubricants market is highly fragmented. After China, India is becoming the manufacturing hub due to foreign direct investments, availability of skilled and unskilled labours, favorable government policies, thus experiencing a rapid economic growth. “Due to this speedy growth in APAC, highly sophisticated fast-productive machining is the latest trend in this part of the globe. Moreover, there is an increasing inclination on Total Quality Management (TQM) and an emergence of environmental friendly products – like bio-degradable or near-dry machining application (minimum quantity lubrication or MQL). Slowly India is experiencing some of this revolutionizing trends but it will take another three to five years to witnessing further changes,” says Lal. Metalworking fluid is an important business for the industrial lubricant segment. The sector is highly competitive in Indian context but has a bright growth prospect in near future. Globally, there is an increased demand for semi-synthetic and synthetic oil over regular mineral oil due to cost-effectiveness, ability to flow even during winter, and better viscosity index. “Water-based formulations are gaining popularity due to its ability to transfer heat and maintain the life of the engine for a longer duration. The one trend that’s going to dominate the market is biodegradable lubricants. It is going to be the crucial component in all the future formulations,” says Mehta. With Indian government implementing Bharat Stage (BS) IV at the end of 2015 to introduce emission standards and curb air pollution, the lubricant industry has shifted its focus to upgrade the quality of lubricants which certainly seems to be the right trajectory for the industry.